Bishnupur, March 8: International Women’s Day was observed at the Conference Hall, Mini-Secretariat, Bishnupur today. The five students from the district who bagged medals in the first edition of “Khelo India” were also facilitated in the program. 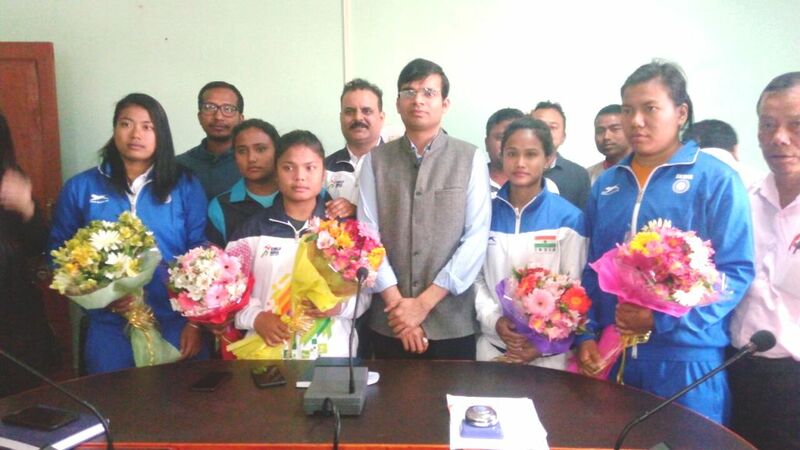 Speaking on the occasion, the Deputy Commissioner Mr. Pawan Yadav IAS highlighted the need to promote gender equality by presenting bouquet of flowers to the girl students brought pride to the district – Konsam Ormila Devi, Lamabam Nilam Devi, Potshangbam Umeshwori Devi, Warepam Sapana Devi and Arambam Anju Devi who won medals in the first edition of “Khelo India” He also encouraged them excel in their own category of sports even at the Olympics. He further said that the administration will leave no stone unturned to assist them in any way possible. The function is attended by district level officers, public leaders and leaders from different women organizations.